Private collection, Paris (acquired from the above, circa 1950). XXe siècle, no. 1, 1951, p. 11. "Georges Braque" in Le Point, 1953, p. 30 (illustrated). F. Laufer, Braque, Bern, 1954, no. 44 (illustrated in color; illustrated in color again on the cover). J. Richardson, "The Ateliers of Braque" in The Burlington Magazine, vol. 97, no. 627, June 1955, pp. 164-170, fig. 2 (illustrated, p. 167). J. Richardson, "George Braque's New 'Atelier'" in L'Oeil, no. 6, 15 June 1955, p. 16. M. Gieure, G. Braque, Paris, 1956, pp. 83-84. Galerie Maeght, ed., Catalogue de l'oeuvre de Georges Braque: Peintures, 1948-1957, Paris, 1959, no. 7 (illustrated; incorrectly listed as unsigned). J. Richardson, Georges Braque, London, 1959, pp. 23 and 27-29 (Atelier series discussed). J. Russell, G. Braque, London, 1959, p. 32, no. 65 (illustated in color). J. Leymarie, Braque, Geneva, 1961, p. 107. E. Mullins, Braque, London, 1968, pp. 166 and 213, no. 124 (illustrated, p. 167; incorrectly listed as unsigned). F. Ponge, P. Descargues and A. Malraux, G. Braque, New York, 1971, p. 197 (illustrated in color, p. 196; incorrectly listed as unsigned). F. Ponge, P. Descargues and A. Malraux, G. Braque, Paris, 1971, p. 197 (illustrated in color, p. 196). D. Cooper, Braque: The Great Years, exh. cat., The Art Institute of Chicago, 1972, pp. 91 and 94. R. Cogniat, Braque, Naefels, 1977, p. 65 (illustrated in color; with incorrect cataloguing). N. Pouillon and I. Monod-Fontaine, Oeuvres de Georges Braque, exh. cat., Centre Georges Pompidou, Paris, 1982, p. 148, fig. 2 (illustrated). S. Fauchereau, Braque, Paris, 1987, p. 127, no. 117 (illustrated in color). B. Zurcher, Georges Braque: Life and Work, New York, 1988, pp. 238, 244-245, 250 and 254, no. 194 (illustrated in color, p. 239). J. Leymarie, Braque: Les ateliers, Aix-en-Provence, 1995, p. 230, no. 86 (illustrated in color, p. 187). J. Golding, S. Bowness and I. Monod-Fontaine, Braque: The Late Works, exh. cat., Royal Academy of Arts, London, 1997, pp. 6, 8-10, fig. 5 (illustrated, p. 6; Atelier series discussed pp. 72-73). Paris, Galerie Maeght, Georges Braque, January-February 1950, no. 1. Kunsthalle Bern, Georges Braque, April-May 1953, no. 101 (illustrated). Kunsthaus Zürich, Braque, 1953, no. 115 (illustrated, pl. XXIII). Munich, Haus der Kunst, Georges Braque, October-December 1963, pp. 52-53, no. 116 (illustrated, fig. 108). Paris, Orangerie des Tuileries, Georges Braque, October 1973-January 1974, p. 50, no. 116 (illustrated, p. 149). Saint-Paul de Vence, Fondation Maeght, Georges Braque, July-September 1980, p. 200, no. 116 (illustrated, p. 123). Washington, D.C., The Phillips Collection; The Fine Arts Museums of San Francisco, The California Palace of the Legion of Honor; Minneapolis, Walker Art Center and Houston, The Museum of Fine Arts, Georges Braque: The Late Paintings, 1940-1963, October 1982-September 1983, p. 38, no. 24 (illustrated in color, p. 65). Saint-Paul de Vence, Fondation Maeght, George Braque, rétrospective, July-October 1994, pp. 198 and 297, no. 91 (illustrated in color, p. 199). Paris, Grand Palais, Georges Braque, September 2013-January 2014, p. 315, no. 190 (illustrated in color). As Braque was painting Atelier I in 1949, he was setting out on a series that would prove to become the great valedictory achievement of his final period, a sequence of eight canvases that reflect upon his entire career, taking as their "subject matter," John Richardson has written, "painting itself, as practiced by the artist in the privacy of his studio. The Ateliers are a microcosm of the painter's professional universe" (op. cit., in The Burlington Magazine, June 1955, p. 165). Set in the austere interiors of the artist's studios in Paris and Varangeville-sur-Mer, including some ordinary furnishings and possessions, and in the present picture--a singular occurrence in his oeuvre--the rendering of another actual painting still in progress, the Ateliers are compositions of remarkable depth and complexity, which reveal a profound visual poetry and intriguing philosophical nuances. These magnificent paintings are, as Richardson has pointed out, "more explorative in their handling of space and more profound in their metaphysical concerns than anything else being done in Western Europe at the time" (Sacred Monsters, Sacred Masters, New York, 2001, p. 237). Braque completed the first six Ateliers, numbered I through VI, between 1949 and 1951. He commenced work on Atelier VII in 1952, brought to an initial conclusion and signed this canvas in 1953, but then decided to extensively revise the composition, which he exhibited in 1956 as Atelier IX. The apotheosis of the series is Atelier VIII, the actual culminating work, which Braque began in early 1954 and completed the following year (fig. 1). Richardson, while visiting and interviewing the artist, closely tracked the progress of the Ateliers. "These Studios," he wrote, "may be said to crown Braque's career, for they sum up in an entirely new and personal idiom all the discoveries that he has ever made" (op. cit., 1959, p. 27). "These paintings of interiors represented a tremendous immersion in myself," Braque explained to André Verdet in 1962. "As I painted them I was gripped by a kind of jubilation... I was in the happy state of someone to whom is revealed the harmony of objects between themselves and with man. The objects faded away, leaving me the imprint, the echo of their poetic relationships. They no longer existed. My work was enlightened and it enlightened me. Everything became simple and full of meaning" (quoted in J. Golding et al., op. cit., p. 74). The convention of the atelier painting offers an artist the opportunity to contemplate the inner, private world of his dedicated occupation, showing off some measure of his achievement, and at the same time registering the current state of his art, while throughout this effort revealing the mysteriously inspired processes of an introspective creative mind. The most famous studio painting of the 20th century is Matisse's L'atelier rouge, 1911 (fig. 2), in which the artist laid out his own mini-retrospective as a visitor might have seen it in his studio, moreover in a way that reflects his particular ideas about pictorial invention, not least of which is the famous red wall: the color is pure fiction--Matisse's studio wall was white. The modernist atelier is both a real place and a state of mind, the intuitive comingling of reality and imagination as transfigured via paint into the artificial syntax of visual forms. Braque's own precedent for his late Ateliers is the group of sumptuous still-life/interiors he painted in 1939, on the eve of the Second World War (fig. 3). There were the trials and tribulations of wartime to be experienced, the deepening wisdom of his accumulated research of which to take stock, before Braque decided to take up this theme once again--fully a decade later on--this time in a manner in which the studio had become a field of play without boundaries, more open, expansive and contemplatively profound than previously. Atelier I, as the initial painting in this namesake series, is the "genesis" work, marking the artist's passage into the realm of his chosen theme, giving some idea of both its manifest realities and inwardly recondite spaces, establishing the groundwork for his approach, while creating an opening for the diverse possibilities of form and process which he would further develop in subsequent works of the series. "Studio I is formally and structurally," Douglas Cooper pointed out, "the simplest and most direct of the group" (op. cit., p. 91). Braque's conception of space in his first Atelier is straightforwardly rectangular; the insistently vertical and horizontal planar elements suggest a relatively shallow environment, which nonetheless unfolds by means of superimposed forms to a purposeful effect: the presentation of two distinct pictorial images, stepped one above the other, each in itself a painting. Braque has moreover suggested the presence of a third painting, presumably contained within the ornate frame, one side of which is visible along the lower left edge of the composition. "The picture is of extraordinary presence and beauty," John Golding declared (op. cit., p. 8). The object common to both painted pictures within Atelier I is a large jug. There is, in fact, a prominently placed vessel--a pitcher, vase or simply a glass, a modern descendant of the great amphoras of antiquity--in all eight Ateliers (figs. 1 and 4). This ovoid container becomes the great egg, as it were, from whose shell Braque would draw forth and generate the various elements of his composition, in this canvas as well as those that follow. The vessel serves as the fundamental form or point of reference on which all else is centered. "The point of departure is the void," Braque stated, "a harmony in which words go farthest, have most meaning" (quoted in L. Goldaine and P. Astier, eds., Ces peintres vous parlent, Paris, 1964). "A vase gives form to emptiness," he furthermore observed (quoted in op. cit., p. 97). The two jugs--one white, the other black, seen one above the other--function as opposing but complementary yin and yang object-forms. According to Richardson, "Braque experimented with a piece of paper cut out in the form of a jug before finally achieving this effect" (op. cit., 1955, p. 166). "Braque seems to be pointing up a contrast between the loose forms, modeling and matière of the lower painting," Cooper observed, "and the tautness of the wholly white flat pitcher in the upper one, where the eye feels volume, although there is no modeling, simply because of the confrontation of white and black" (exh. cat., op. cit., 1972, p. 91). Richardson suspected that the lower painted image was an actual Braque canvas; with the aid of the Maeght catalogue de l'oeuvre, it has been positively identified as Pichet noir et citrons, 1949 (Peintures, 1948-1957, no. 14), a canvas that the artist continued to work beyond the already advanced state he depicted here. From these few fundamentals, Braque has generated his inaugural theme, establishing a narrative of time within this flattened space, signifying--as Golding has proposed (exh. cat., op. cit., 1997, p. 8)--painting past (the frame), present (the black pitcher, a painting in progress), and future (the white pitcher, the painting as idea). 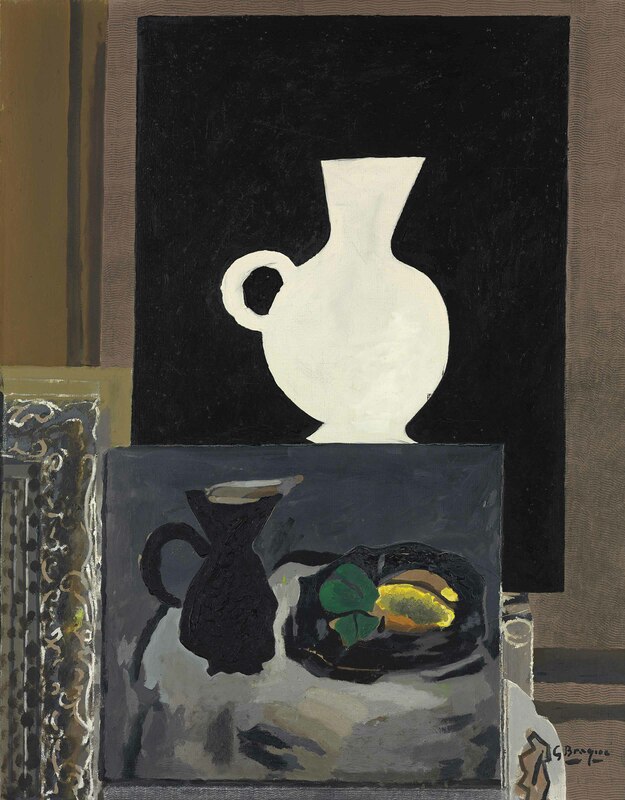 Or is Braque perhaps following the river of time running in the opposite direction?--that is, from the conception of the idea (the blank white jug), the painting of the image (the black jug and still-life below) and finally, its presentation and exhibition (the frame). The opening lines in T.S. Eliot's poem "Burnt Norton" (1935), the first of his Four Quartets, meditate upon our multi-directional perception of time: "Time past and time present Are both perhaps present in time future And time future contained in time past If all time is eternally present..." This is indeed the first of many ambiguities that Braque would write into his Ateliers. The fundamental theme here--very Proustian, indeed--is that creativity, art in all its powerful totality, takes place at the intersection of memory (the past--the frame) and imagination (the future--the jug as void). Braque wrote: "I am no longer concerned with metaphors but with metamorphoses" (ibid., p. 89). Its simplicity notwithstanding, Atelier I is nonetheless steeped in this concept of transformation, as objects materialize and interact with one another. "Nothing in these pictures is ever quite what it seems," Richardson has observed. "Sometimes shadows have substance, while things of substance turn out to be shadows, forms are flattened and flatness is given form...what should be opaque appears transparent, and vice versa... This element of metamorphosis is the very strength of these Studios, for it endows the mundane objects with a more meaningful and universal reality, what Braque calls a 'new destiny'...a moving tribute to art itself" (op. cit., 1959, pp. 27-28). More than four decades on, the transformative powers of Cubism were still casting their spell on Braque, one of this pioneering movement's greatest founding fathers, guiding his latest research into the ways in which material objects inhabit their real places, pictorial space, and the dimensions of the inner mind. "No object can be tied down to any one sort of reality," the artist explained to Richardson. "Everything, I realized, is subject to metamorphosis; everything changes according to the circumstances. So when you ask me whether a particular form in one of my paintings depicts a woman's head, a fish, a vase, a bird, or all four at once, I can't give you a categorical answer, for this 'metamorphic' confusion is fundamental to what I am out to express" (quoted in ibid., p. 26). "Do these ideas of mine derive from Zen-Buddhism? I don't think so. True, in recent years I have read a great deal about Zen-Buddhism but this philosophy has had no influence on me... I am only interested to find how closely certain tenets of Zen-Buddhism correspond to views that I have held for a long time. "You see, I have made a great discovery: I no longer believe in anything. Objects don't exist for me except in so far as a rapport exists between them or between them and myself. When one attains this harmony, one reaches a sort of intellectual non-existence--what I can only describe as a state of peace--which makes everything possible and right. Life then becomes a perpetual revelation. That is true poetry" (quoted in ibid.). Christie's is honored to offer Atelier I by Georges Braque, the inaugural canvas from the artist's monumental series which, from its inception, has been considered a summation of his entire artistic career. This exceptional painting is sold to benefit the American Hospital of Paris. The sale of a painting marks the first of its kind for this not-for-profit institution. Founded in 1906 by members of the American community in Paris, the American Hospital of Paris has been delivering high quality care to the American, French and entire International communities for over 100 years. It offers global expertise, combining the most advanced diagnostic technologies, state-of-the-art treatment techniques and individualized care. With the sale of this painting, the American Hospital of Paris furthers its commitment to excellence through the acquisition of the most advanced diagnostic equipment.